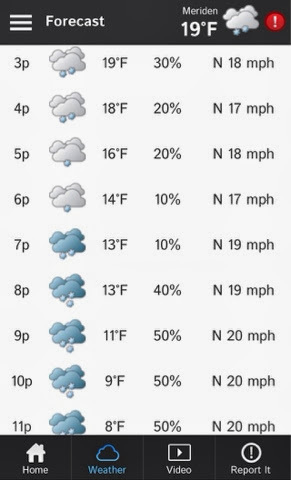 This is our weather forecast for the day, according to WTNH.com. We can already see a dusting, but it's supposed to worsen, and several schools have early dismissal today. Rather than prep you for Thirsty Thursday, it may be more beneficial to prep you for the storm this evening and for the future storms we're bound to encounter! I'm no expert at storm survival so I'm taking some tips from a Chiff.com article and can recommend some places to try if you are still preparing for the weather conditions that we're anticipating. If you don't have to drive tonight, don't. Even if you're a good driver, snow + front-wheel drive and/or crazy drivers don't mix well. Stay home today. If New Haven isn't home to you, you can stay at hotels such as The Omni, New Haven Hotel, La Quinta (right off I-95 exit 46) and the Courtyard by Marriott at Yale. Heavy snow on power lines and accidents into electric poles can result in power failure. 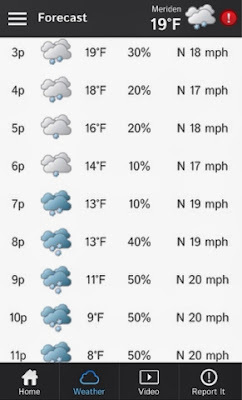 Keep blankets and warm clothing handy! Trailblazer and Denali have cold weather essentials or else you can find blankets at CVS (Westville location) and Walgreens (York Street location open 24 hours). Chiff.com recommends: "batteries, flash lights, battery operated radio/television, bottled water, toilet paper, nonperishable foods such as cereal or crackers, canned goods, a non electric can opener, a small cooler, candles, prescription medicines and any over-the-counter remedies you use regularly; and if you have young infants or toddlers - diapers, baby wipes, formula, baby food". These items may be found at superstores such as Wal-Mart and Stop & Shop (2 locations -- one on Whalley Avenue and one in Amity Plaza). As mentioned before, there is a chance that some places will be left without power. Be sure to keep your phones charged and keep an extra battery handy if you can. You can get electronic accessories at Radio Shack. Also, write down important numbers in case your battery runs low and you need to get in touch with someone quickly. 5. What Have I Missed? I'm not an expert on this topic, so I welcome any additional ideas in the comments section or on Facebook/Twitter. Good luck, stay warm and be smart over these next few days!